Against all odds, Jurassic World turned out to be a decent movie (which is more than can be said for any of the other Jurassic Park sequels), so of course a sequel to that got greenlit almost immediately. And Mattel's making the toys. The star monster this time is the Indoraptor, since the previous film's Indominus Rex learned there's always a bigger fish. The Indoraptor is not, as you most likely assumed, named after a hybridized strain of hydroponically grown weed that got popular in the early '90s. Nor is it named for India, a la the Utahraptor. Rather, it is the next step in the evolution of InGen's "let's sell dinosaurs as weapons" scheme, so its name is a reference to the Indominus Rex. 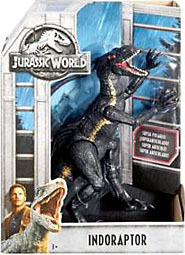 There are several product categories in the Jurassic World: Fallen Kingdom line, but this Indoraptor seems to stand by itself. Sold in a stylish open box that is designed to suggest the dino pens at Jurassic Park. The bright gray bars are similar to the packaging used on all the other toys, but this one has a rainy blue sky in the background rather than everything else's exploding volcano of orange. So it would absolutely stand out in a fully stocked display in the toy aisles... if it wasn't apparently the most in-demand release and thus something you're unlikely to see more than one of at a time. For the record: I saw this one at Walmart a couple months ago, and picked it up; I saw a second at another Walmart weeks later; and then saw a third at Target the same day the movie opened, and that's it. This shortage is disappointing, because this really is the best toy in the line so far. 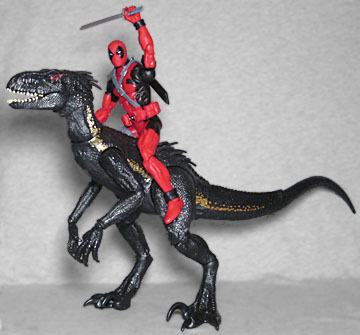 It's basically a Marvel Legends dinosaur. Bust out your Nico Minoru figure and this can be Old Lace! The figure is more than 15" from nose to tail (you have to plug the tail in after you open the box) and is tall enough to look intimidating next to 6"-scale humans. The real draw is the articulation, however. The Indoraptor moves at the jaw, head, shoulders, elbows, wrists, hips, knees, ankles, and twice in the tail, and other than the hinged jaw, everything is either a balljoint or a swivel/hinge joint. 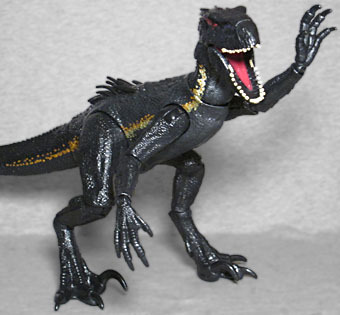 The team working on Mattel's DC Comics action figures are still putting plain swivels in the figures' wrists, but the Jurassic World team is over here delivering a super-articulated raptor. The wrist joints are a little bit gummy, especially in the summer heat, and it can be difficult to find a pose where the toy is balanced (the more upright you can pose her, the better), but still - this is almost as good as those Beasts of the Mesozoic, despite being mass-market. The sculpt is no slouch, either. 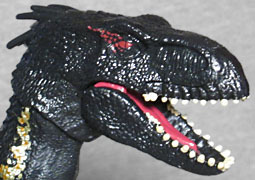 The Indoraptor's body is the usual raptor shape you expect from years of watching Jurassic Park movies, though th head is more "Rex-y," with that blockier snout.The skin is sculpted with thousands of scales, and there are a few soft, spiny protrusions on the head, back and arms that are probably meant to suggest feathers. One of the problems with Indominus Rex as a potential weapon was that it was the size of a small building - camouflaged or not, that's a hard thing to ignore. So the gigantic I. rex is out, and the smaller, stealthier Indoraptor is in! 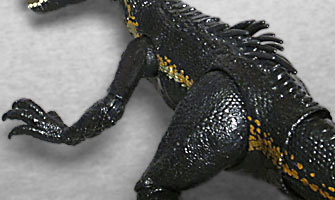 In keeping with that iea, the skin is a shiny bluish black, with a big gold stripe down each side. The red eyes are menacing, but it seems like the mouth could have used some more subtle paint apps: the teeth are bright bright white, not the more natural dirty color seen in the film, and the tongue is just a solid candy apple red. But those are at best minor flaws with an otherwise-excellent toy. 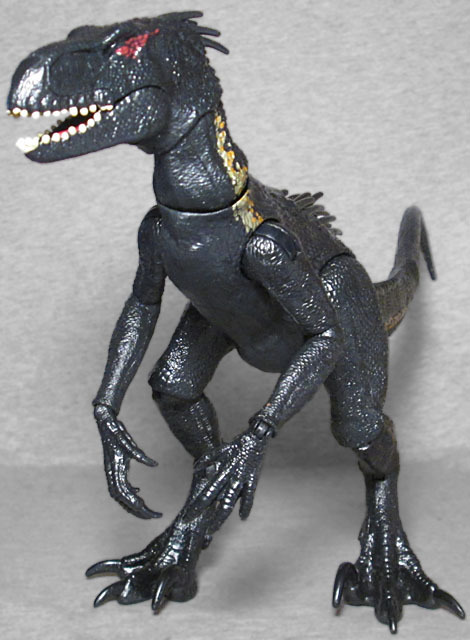 The Indoraptor retails for about $20, which is a surprisingly good deal for a dinosaur toy of this quality. We don't know if the scarcity issues will get cleaned up at some point, so you probably shouldn't hesitate if you do manage to find one.